A range-restricted, but locally common species that is not in danger of extinction. Richtersveld, from the Fish River Canyon (Namibia) to the Ploegberg. Cracks and crevices at the base of low, rocky hills, in or near dry streambeds or drainage lines. This species is threatened in parts of its range by habitat loss to mining, and habitat degradation and trampling due to overgrazing. This species is locally common, but localized to suitable habitat, particularly after good rainfall. It is declining over parts of its range due to habitat loss and degradation. It cannot be relocated at the type locality on Helskloof, and is possibly locally extinct there. Most records are however from the remote, arid eastern parts of the Richtersveld that is unsuitable to grazing, and these subpopulations are stable. Steiner, K.E. 2006. 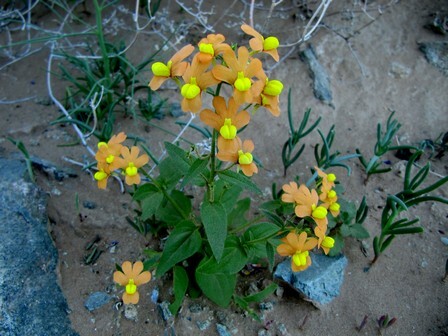 Two new species of Nemesia (Scrophulariaceae) from southern Africa. Bothalia 36(1):39-44.